Following Amazon Spain’s recent cancellation of pre-orders for Crackdown 3 and the resulting panic from fans that there had been another delay – or worse: a cancellation – Microsoft has promised that there’s nothing to worry about. While assuming that cancellations of pre-orders in one region means cancellation of a game outright may seem like a conclusion jump of, well, Crackdown proportions, it’s not surprising that fans are concerned. 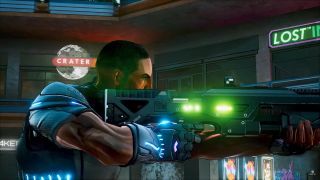 Following its reveal at E3 2014, Crackdown 3 has faced multiple delays. The game even had a firm release date in 2017 until it was pushed into an unspecified time in 2018. Plus, Microsoft has somewhat abruptly cancelled games before. However, this time it looks like fans have nothing to worry about. The last we heard, Crackdown 3 was due to have a Q2 or Q3 release date for this year and we’re not quite at the end of Q2 yet so there’s certainly still time left. We imagine Microsoft will want to give the game its final release date and one last push at this year’s E3 before launch.